Vary this dish by adding banana peppers or grated cheese. 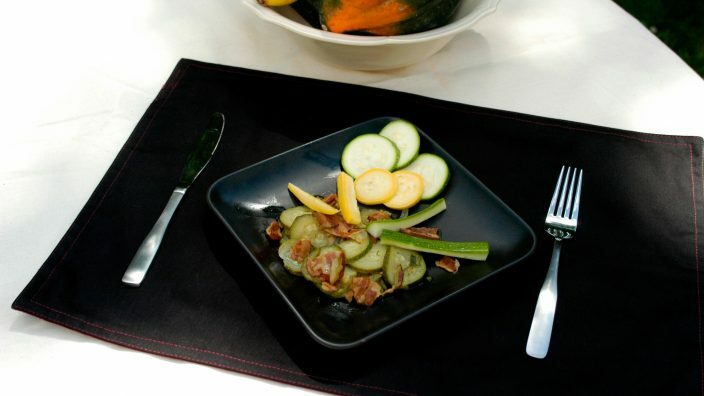 Use small, fresh zucchini that are no more than 1 to 1 1/2 inch in diameter. Wash and dry the zucchini. Slice 1/8 inch thick. Slice the bacon into 1/2 inch pieces. Cook in a skillet over medium heat until the bacon is crisp. Pour off excess fat except for 1 1/2 tablespoons. Saute the chopped onion on low heat until translucent. Add the zucchini and stir with the bacon and onion. Cover the skillet and cook 7 minutes over medium-low heat until zucchini is tender. Add salt and pepper as desired. Serve immediately. Variations include adding chopped banana pepper to cook with the onion or adding 1/2 cup grated Monterey Jack cheese over the cooked zucchini before serving.